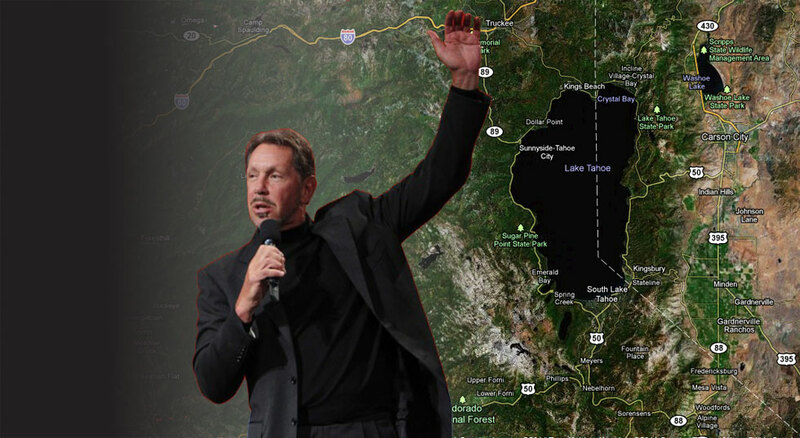 Billionaire Larry Ellison, perhaps the nation’s most avid trophy-home buyer, has taken serial property buying to new extremes. His latest target: Lake Tahoe – the resort area straddling the California-Nevada border. The property has about 420 feet of lake frontage, according to public records, as well as two private piers and a private beach. Plans filed with Washoe County show more than eight separate structures totaling more than 18,000 square feet, including a main house with a pool and spa overlooking the lake, a beach house, a cottage and a writer’s cabin. According to the plans, the main house, three-bedroom beach house and “West House” are located on the side of the property closest to Lake Tahoe. The writer’s cottage and a clay tennis court and tennis pavilion—with a lounge, fireplace, fold-down bed and powder room—occupy the middle of the property. Closer to the street are another cottage and a caretaker’s cottage. A guard house is at the entrance. The compound is scheduled to be completed next fall, according to a construction schedule filed with the Tahoe Regional Planning Agency. Mr. Ellison has spent $102 million in the last several years buying property, both on and off the market, to assemble three different parcels fronting the 191-square-mile lake. He often buys several adjacent properties to combine into a single sprawling compound. The portfolio of Oracle Corp.’s co-founder includes five adjacent lots in Malibu, Calif.; a Newport, R.I., mansion formerly owned by the Astor family; a historic garden property in Kyoto and an estate in Rancho Mirage, Calif., with a private, 19-hole golf course. In Malibu Mr. Ellison owns a hotel and two restaurants, the five adjacent lots on Carbon Beach that cost a reported $65 million and at least two other homes. In Rancho Mirage, near Palm Springs, Calif., he bought a 249-acre estate earlier this year for $49 million. In Kyoto, Japan, he owns a garden property with a home, pavilion and gardens fed by the freshwater Lake Biwa, according to a person familiar with the deal. With an asking price of about $86 million, it was purchased in the last several years after a representative of Mr. Ellison’s learned of the property while attending an art auction. In San Francisco’s tony Pacific Heights neighborhood, he owns a five-bedroom, four-level home, purchased in 1998 for $3.8 million. In Newport, Mr. Ellison owns an Italianate-style mansion previously owned by the Astor family and purchased in January 2010 for $10.5 million. Mr. Ellison’s other holdings include two properties in Woodside, Calif., a wealthy Silicon Valley community. One, a 23-acre estate modeled on a 16th-century Japanese emperor’s residence, was designed and built over nine years and completed in 2004, according to San Mateo County. In 2011, the county assessed it at $70.4 million. The other was purchased for $23 million in 2005 and is now for sale, asking $19 million.